1. Cook the potatoes in boiling water for 5–8 minutes until just tender, then drain. 2. 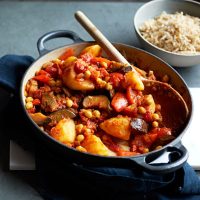 Meanwhile, heat the oil in a frying pan and stir-fry the onion, aubergine and pepper for 8–10 minutes. Add the curry powder and cook for 1 minute more. 3. Stir in the chopped tomatoes, 300ml water, chickpeas and reserved potatoes, and cook for 10 minutes. Season to taste and garnish with chopped coriander (optional). Serve with cooked rice or warm naan breads.